Howdy! Thanks for staying with us. We appreciate it more than you know. In order to make your stay as enjoyable as possible, we've laid out some ground rules to help things run nice and smooth. We strive to be as reasonable as human beings as a we can. And we really like it when other reasonable human beings come and stay with us. It just makes life better. So join us in this reasonable human being movement. Let's enjoy ourselves and respect thy neighbors. If you ever need anything don't hesitate to reach out to us. We are always happy to help you. And if you could abide by these simple commandments, this park just may reach utopia status. Quiet Hours : Quiet hours are from 9:00 pm to 7:00 am. Please respect your neighbor. And if your neighbor ain't respecting you, please let me know. Speed Limit : Speed limit throughout the park is 10MPH. At all times! :) Slow your roll. No need to burn rubber. Check Out : Check out time is 12pm for all guests. We cannot guarantee the same site if you choose to extend your stay, but we'll darn sure try our best to make it happen. We are people pleasers. You're paying us for the service after all. Please check with the office as soon as you can to see about possible extensions. Timely Payment : We ask that all site fees be paid in full prior to or at time of move in. Unless, of course, some other arrangement has been worked out with management. If you are a weekly or monthly resident, site rent is due on the first day of your new rental period. A late fee of $20/day will be applied starting on the 3rd day you are late and applied again each day thereafter, until the bill is paid in full. We work hard to keep the park clean and take care of any issues as soon as they arise (day or night) and would really appreciate some reciprocation in the form of respecting the rules and timely payment. Pretty please with a cherry on top. Pets : PETS MUST REMAIN ON A LEASH AT ALL TIMES WHILE IN THE PARK. Please pick up all pet droppings and try to keep your pet quiet. We like the park quiet and so do your neighbors. Please DO NOT LEAVE DOGS OUTSIDE UNATTENDED. Park does NOT allow dangerous breeds such as Dobermans, Rottweiler, Chows, Pit Bulls and German Shepherds. Children : Parents are responsible for the conduct of their children and financially responsible for any damages incurred by their children. Children under the age of 10 must be accompanied by their parents while in the park. Guests : RV site rates include 2 adults and 2 children under the age of 16. Children under 3 years of age are free. Extra person charges are $5 per day per person for daily sites. Extra person charges for monthly sites are $100 per month per person (4 adults allowed, maximum). Smoking : ALL buildings are NON-SMOKING. While on property, please dispose of ALL cigarette butts safely in proper containers, not on the grounds. Up to $50 fine for cigarette butts left at site. Firearms and fireworks are strictly prohibited. C'mon guys, a little bit of care goes such a long way. Vehicles and Trailers : Limit of two (2) vehicles permitted per site. Additional vehicles are $7 per week and $25.00 per month. Boats, utility, automobile, or boat trailers can be stored here. All must be parked in the designated storage area. Storage fees will vary. Inquire within. We'll make a deal with you. RV Site : KEEP GRASS FREE OF ANY AND ALL ITEMS. Please respect this rule, it's a real pet peeve of mine. Damage fees may apply for rutting grass. All sites must be kept neat and tidy, nothing is to be stored under the RV or around the RV site. Do not hang towels/ clothes outside your RV or post "For Sale" signs on your RV/vehicles. Clean up fee of $25 will be applied if grass is stained with oil, algae or other contaminants. RV Condition : We ask that your RV be in reasonably good condition. If you think your camper is in questionable condition, please call and ask prior to arrival. More importantly is the individuals inside the camper. We want friendly people that keep their site clean and respect thy neighbors. That's more important than the rig to us. Washing : You may wash your own vehicle for a fee : cars $7.00 and RV's $15.00. Please pay in the office. Refunds : Refunds will be addressed on a case by case basis. I'm a reasonable human and will work with you when possible. If you choose to shorten your stay or have to be asked to leave due to violations of rules, there likely will be no refund. 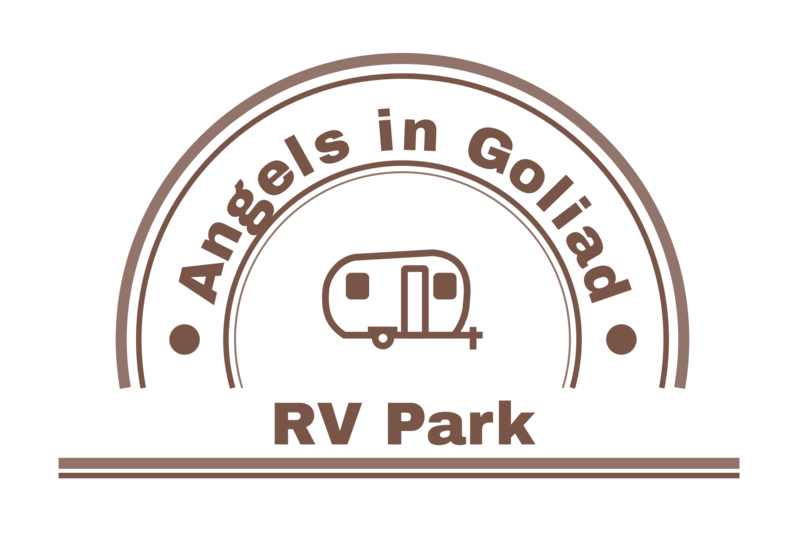 By law, Angels in Goliad RV Park is a service oriented business and therefore, we do not have a landlord/tenant relationship/agreement with any daily/weekly/monthly guests. The Park will not be responsible for theft or injury occurring during your stay. We reserve the right to refuse service to anyone. The owner, management or office personnel of the Park are in no way liable for any damage to the personal possessions of the tenants or their guests.